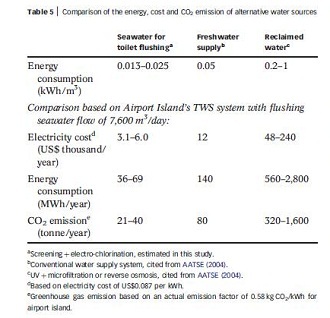 In 2012 Airport Authority Hong Kong in conjunction with their partners (Hong Kong University of Science and Technology, Delft University of Technology and the Environmental Protection and Water Supplies Departments of the Hong Kong SAR Government) published a paper in the journal of Water Science and Technology on the outcomes of their full scale implementation of the innovative Triple Water System. Mike Kilburn of the Airport Authority Hong Kong shares with us how this system delivers major cost, water and energy savings. 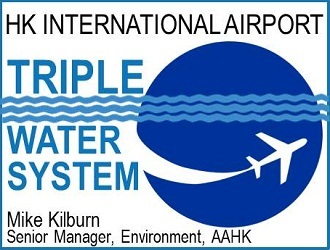 Hong Kong International Airport’s (HKIA) triple water system (TWS) was installed in 1998 at a cost of US$70 million. Today it serves a community of some 60,000 airport staff and up to 200,000 passengers per day. Airport Authority Hong Kong is responsible for the management and day-to-day operations of the airport. Leveraging the installation of the much larger network that provides seawater cooling for air conditioning, the TWS incorporates the use of seawater for toilet flushing with more traditional freshwater and reclaimed water systems. This substantially reduced the capital expenditure required for a traditional “dual” reclaimed freshwater system, from US$62 million to US$20 million and thereby reduced the payback period from forty years to just ten. The TWS has reduced potable water usage by 52% compared with a pure freshwater system, and delivered substantial reductions in operating costs, energy usage and associated carbon emissions. Hong Kong is a highly water-stressed city, with an annual renewable water supply of just 125m3per capita. This was recognized as a problem long before Hong Kong’s population reached its present size, and the use of seawater for toilet flushing was introduced in the 1950s. Some 80% of Hong Kong’s seven million people now use sea water flushing systems, saving 750,000m3 of potable water per day (about 20% of the total supply), making Kong Kong a global leader in alternative water usage. Seawater is also used, albeit less widely, for water-cooled air-conditioning systems. 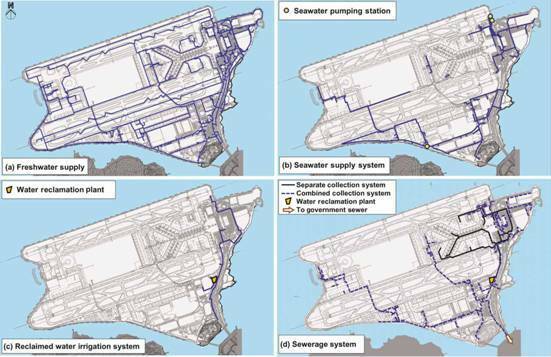 Every day the daily operations of HKIA consume some 9,000 m3 of potable water, 800m3 of reclaimed water and 380,000m3 of seawater. These are delivered through three separate supply pipelines for seawater, potable water and reclaimed grey water and connect to two separate systems which collect treat and dispose of grey water and black water sewage. Three dedicated pumping stations abstract the seawater. Three layers of screens and an electro-chlorination system remove any debris and disinfect the seawater before it is distributed across the site through a dedicated 36km network of polyethylene and uPVC pipes. The air conditioning system uses some 375,000m3 of seawater in a “once-through” process before discharging it back into the sea. The seawater flushing system uses about 7,300m3 per day. A further 300m3 is used to dilute and flush aircraft toilet waste into the public sewage system. HKIA uses some 9,000m3 of potable water for catering and food preparation, hand-washing sinks, drinking water, aircraft washing and the firefighting system. Once used, the grey water is collected and transported to the waste water treatment works through a dedicated network of pipes. The treated grey water (800m3) is used for irrigation of lawns and landscapes, particularly around the terminal buildings. This use of reclaimed water was further reduced by AAHK’s selection of drought-resistant grasses for the grassland around the airfield, which saves some 1,400m3 per day. Through adoption of the TWS AAHK was able to reduce its use of potable water by 52%. 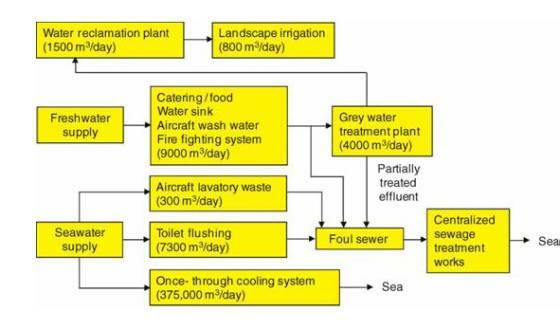 These reductions comprise a 41% reduction through use of seawater for toilet flushing, a 7% reduction through the use of drought-resistant grasses on the airfield environs, and a further 4% from reuse of grey water. The purpose for building the TWS was to minimize the use, treatment and associated costs for potable water without limiting the options for reusing reclaimed water. The principal saving comes from the reduced capital and operating costs required for processing saltwater compared with freshwater. 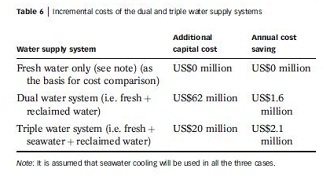 An assessment of the costs prior to construction showed that a “dual freshwater system” (potable + reclaimed water) would require US$62 million more than a purely freshwater system to deliver annual savings of US$1.6 million (for a 35-40 year payback). The connection of the toilets to the saltwater supply network cost US$20 million. The reduced capital costs and US$2.5 million in annual savings derived from reduced purchasing of potable water and a lower waste effluent surcharge (less US$0.5 million for maintenance of the seawater supply system) delivered a payback period of just ten years. In addition to the water-related savings, the TWS delivered further improvements over a freshwater system through a reduction in energy usage, as well as significantly lower greenhouse gas emissions. Using seawater for flushing requires just 25-50% of the energy required (0.013-0.025kWh/m3) if the same amount of freshwater were used (0.05kWh/m3). The savings in greenhouse gas emissions follow a similar pattern. At present usage seawater flushing generates 21-40 tonnes of CO2e per year compared to the 80 tonnes of CO2e per year generated by a dual freshwater system. he costs and impacts of generating reclaimed water are substantially higher. In addition to the costs of building, maintaining and operating the waste water treatment plant and water reclamation plant (US$0.7 million) every cubic metre of reclaimed water generated requires 0.2 – 1kWh and generates CO2e emissions of between 320 and 1600 tonnes per year. This cost is not avoidable as AAHK must run the waste water treatment plant in order to comply with the water quality standards of the Hong Kong SAR Government. AAHK is already exploring ways to extend the use of reclaimed water. These include increasing irrigation of landscaped areas further away from the terminal buildings, using water for site management in construction projects (dust control and vehicle washing), and for washing aircraft. The principal constraint is the high cost of laying the pipes required to deliver the reclaimed water to the places it is to be used. Mike Kilburn joined Airport Authority Hong Kong as Senior Manager, Environment in September 2012. He is responsible for developing a strategy to position HKIA as the world’s greenest airport. He is also responsible for developing the Authority’s sustainability strategy and producing the first sustainability report (in June 2013).